I have recently seen two statements that imply that using water-soluble phosphate fertilisers increases the risk of loss of phosphate to surface water, with its adverse environmental implications, and that the majority of the phosphate applied to soil becomes fixed in the soil and is unavailable to plants. Neither statement is true..
With the huge increase in growing forage maize to feed anaerobic digesters, especially in the arable areas of Eastern England, it seems appropriate to consider the harvested offtakes of phosphate and, especially, the high amounts of potash removed. 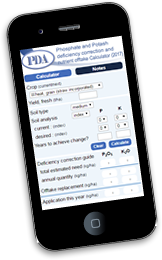 Soil sampling for the routine measurement of P, K, Mg indices and pH is familiar to most advisers and farmers, with the same well-proven method used for many years. But how are things different where minimum cultivation is practised? This year we sponsored the Crop Nutrition essay at Newcastle University and Melissa Gorst, a 2nd year agricultural degree student, won our prize with this essay. Grass cut regularly, as silage, haylage or hay, removes very large amounts of potassium (K). Unless this is replaced, soil K concentrations will fall. In recent years there is evidence of an overall increase in the number of grassland soils below target index (2-), as well as a decline in the use of potash fertiliser. This situation is not sustainable and grass yields will fall unless corrected.